Because of final papers and the end of the semester, April was a really slow reading month for me. I read three novels and a handful of poems, but for the most part, I spent the past month huddled up in bed writing. Of the three books I read, As I Lay Dying by William Faulkner really blew me away. I was lucky to have a brilliant teacher guide me through this book (which is so easy to get lost in), and as a result, I’ve settled on an interpretation of As I Lay Dying that is quite different from most people’s interpretation of it, and I just have to talk about it. This post is going to be a little different from others on my blog, so buckle your seat belts and hold on tight. The literature student in me is about to come out. If you had asked me a month ago my opinion on William Faulkner, I would have promptly told you that I hate that guy. But that was before As I Lay Dying. This book converted me into a Faulkner lover. Warning: there will be spoilers, so if you’re planning on reading this book at some point, don’t read any more of this post. If you Google what the underlying themes of As I Lay Dying are, the internet will tell you that the book deals with issues of social class, and that, in my opinion, is an insultingly oversimplified interpretation of this novel. If you had to place Faulkner into a school of literary criticism, he would fall in with the structuralists. He is obsessed with the relationships between words and actions, what is written and what is heard. That is why there are so many typographical inconsistencies (not errors!) throughout the text. He randomly switches to italics or “forgets” to include beginning quotation marks or doesn’t capitalize names, but if you don’t read the book, if you simply hear it, you won’t notice these things. Through these inconsistencies, Faulkner is telling us that the monologues that comprise the story weren’t spoken monologues. They were inscribed. They rely on being seen, because that’s the only way these shifts in form can even be noticed. But the question is why is it important that we know that the monologues were written, not spoken? I’m going to do my best to answer it, but first I’m going to point out some weird, but important, things that happen throughout the novel. Darl is able to see things happen even when he isn’t there to see them. He also describes himself as “are” not “is,” which suggests that sees himself as existing in a divided state. Each character has a specific idiom, or way of speaking, but sometimes that idiom is disrupted. For example, Vardaman’s inner monologue and outer monologue don’t match. At some points, he thinks much more eloquently than someone of his age and educational background should be able to, but he speaks in dialect. Dewey Dell, a backwoods country girl who can hardly form a grammatical sentence, is somehow able to quote Shakespeare. Darl knows what cubism is. Cash and Vardaman refer to events that happen in the future but that they could not possibly know about at the time (Mrs. Bundren, the bananas, the toy train). Addie Bundren, who is dead, has a monologue. Dead people can’t talk. Dewey Dell is pregnant, and Darl knows. Jewel is mad throughout the whole novel and has only one monologue. Vardaman is young but knows a secret. Cash is stupid. And Anse just wants a set of false teeth. The premise of the story is that the Bundren family is traveling to Jefferson to bury Addie Bundren, their mother, who dies at the beginning of the novel. Along the way, they encounter some challenges and aren’t able to bury her until nine days after she has died. One night, the family stops at Gillespie’s to break up their trip, and in the middle of the night, the barn burns down. Darl is accused of starting the fire, and after Addie is buried, he is carted off to an insane asylum without any evidence or trial to implicate him. Here’s the thing. I am not convinced that Darl set the fire. Most people would disagree with me, but I don’t think the text supports that Darl set the fire. He had no motive, unlike Jewel, who had to give up his horse and disrupt his life for the trip to Jefferson. Jewel also demonstrates at several points in the novel that he is prone to violence. As I mentioned earlier, Faulkner is a structuralist. He pays attention to words. In the scene describing the fire, there is a recurrence of the word “glare.” The first time it’s used, it describes the fire. The second time, it is described as reflecting off of Jewel’s eyes. The third time, Jewel “glares” at Darl. There is a linguistic evolution in the function of this word that suggests that Jewel and the fire are tied to one another. This leads me to suspect Jewel. And it is not insignificant that Darl’s monologues pay particular attention to Jewel, but Jewel himself has only one monologue. If Jewel set the fire, why does everyone blame Darl? Simple. Darl’s family has a vested interest in getting rid of him. If Jewel started the fire, he needs a scapegoat. Dewey Dell is the one who blames him. Darl’s getting locked away benefits her, because it removes from the picture the only person who knows about her pregnancy. Without Darl, she can get an abortion and no one will ever know she was pregnant in the first place. Vardaman is too young to understand the situation, although he says over and over again that he witnessed something that Dewey Dell made him promise to keep secret. If this secret is that Jewel set the fire, not Darl, it is not in Dewey Dell’s interest that the truth should get out. Cash is too stupid to know any different, and Anse is just in it for the teeth. Now let’s go back to the question of why does it matter that the monologues are written rather than spoken, and consider who is inscribing the monologues. Who is the only person who has the motive and ability to write all of this down? It can only be Darl, who now spends his days in an asylum, where he has the time to learn about grammar and cubism and Shakespeare while he waits to die. 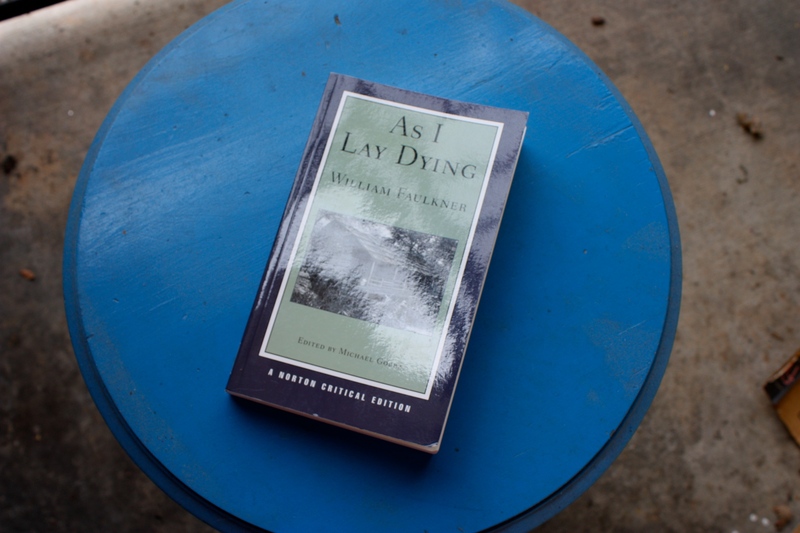 As I Lay Dying serves as his vindication of himself and his implication of his family. This is how Darl is able to see things when he isn’t physically there to see them. He exists in a divided state: the Darl who experienced the events in the novel and the Darl who writes about them. It is also how Dewey Dell is able to quote Shakespeare when she can’t entertain any other grammatically correct thought, and Vardaman can think, but not speak, eloquently. It is also how the other characters can think and act outside of the chronology and how dead-as-a-doornail Addie Bundren can have a monologue. If the book is comprised of spoken monologues, everything I just wrote is irrelevant. Throughout this novel, Faulkner harps on the importance of doing over speaking. He is meticulous in making sure we understanding the importance of physically looking at this text with our eyes, because that means it was written. This is getting a little meta, but bear with me. We can see this importance in Addie’s philosophies about words and language – doing something versus speaking something – and Cash’s obsession with the graphophone. The root words of graphophone literally mean “written” then “heard.” The book itself is a graphophone, elevating the role of doing over the role of speaking, because language is arbitrary. Faulkner was a structuralist. He believed this. The lines of text in this novel are like grooves in a record, but we see them rather than hear them. To fully understand this text, we have to understand that the narration is written, not spoken. In conclusion, this book is incredible. Faulkner is incredible. And as nerdy as it sounds, I’m gong to immediately start rereading As I Lay Dying because I feel like I have so much more to glean from it. Wow, this has turned out to be a much longer post than I intended. Props to everyone who made it this far. I don’t know too many people who get on blogs to read literary analyses, but I hope you found this interesting or helpful. Let me know your thoughts on the novel or what your favorite book of the month was.